Wyoming Estate Services LLC is always available to appraise your personal property. Our experienced, professional appraisers are members in good standing of the Certified Appraisers Guild of America (CAGA), adhering at all times to their strict Code of Ethics. Candidates for the CAGA professional designation are required to successfully complete their rigorous course of training and to pass a comprehensive examination. ESTATE PLANNING: When preparing a will or living trust document, you will be required to make decisions about the distribution of your personal property to heirs and beneficiaries. 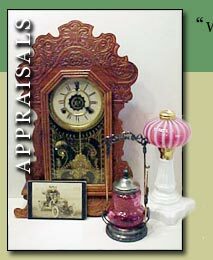 An appraisal of your personal property at this time will give you the information needed to make knowledgeable decisions about its distribution. This can minimize the potential for future disputes among your heirs by avoiding unintentionally disproportionate distributions of value to them. ESTATE SETTLEMENT: An appraisal of personal property will often be required by the courts for estate tax purposes. It may also be needed by the executor or trustee to determine the value of personal property prior to distribution to the heirs. DIVORCE/PARTNERSHIPS: An appraisal can assist in the equitable distribution of property in a divorce settlement or dissolution of a business partnership. Wyoming Estate Services LLC will meet with you to discuss your appraisal needs and to provide you with a cost estimate. All appraisals are billed on an hourly fee basis, based upon the time required to complete the appraisal, in accordance with the CAGA Code of Ethics.You will receive a detailed, written appraisal report, including a listing and description of all property appraised. Photographs will be included where appropriate. If necessary, Wyoming Estate Services LLC can provide expert witness testimony in court.